The large Powerpoint viewing screen in front of me, plotting our course across the vast, blue Atlantic Ocean, shows that our Boeing 777 jetliner has finally reached the European land mass after a 6-hour, 3,628-mile journey from JFK in New York. It is the crack of dawn on April 25th, and the cabin of the plane is silent as most of us continue our transatlantic dozing. Not having ever been to Europe before, I am catching my first glimpse of the continent. Looking down, a warm glow comes over me. There, below us, just as I expect, are small, compact, walkable patches of English towns illuminated by their street lights. Having lived my entire life in America, they did not seem real. They seemed like storybook towns in a Walt Disney movie. Plymouth lay 40,000 feet under us-a quite fitting first glimpse for me, since Plymouth Rock was the first outpost of the US colonies across the Atlantic 5 centuries ago. As an information junkie with a continuously inquisitive mind, I must say that I thoroughly enjoyed the Powerpoint data being fed to us in the cabin. The screen gave us, for the entire flight, our altitude, speed, outdoor temperature (-74 degrees! Yikes!! ), clock time in Paris (our European airport destination), estimated time of arrival, and a map of where the plane was on a global map. These were all of the statistics I was always nagging the flight attendants about, and it was delightful and rather comforting to be able to see it all in front of me throughout the flight. Our planned adventure in our two weeks in Europe was absurdly ambitious. We would spend a few days (two of us with our girlfriends, who joined us for the Paris leg only) in Paris, train to Florence for another few days, see the important cities of the Florence region (Pisa, Cinque Terre, Lucca, San Gimignano, and Siena). Train to Venice for a few days. Then train to Rome for a concluding few days before flying home. Western Europe is 6 hours ahead of Eastern Standard Time. We learn that the jet lag going TO Europe is much worse than returning FROM Europe. Going there, we slept on the plane during the European sleep hours and arrived first thing in the European morning. For our entire trip, the lag simply meant that we were able to stay up later at night (and my insomnia, which has me getting up too early in America, was less of a problem when we needed to get up at what would be ridiculously early hours, EST, while in Europe). By contrast, the trip back to America meant, for us, arrival late at night, EST-what was 11:30 pm in the US felt like 5:00 am western European time after two weeks there. Back home, it was hard to stay up late, and easy to fall asleep early. The result was weeks of falling asleep during the day, and constantly fighting fatigue. 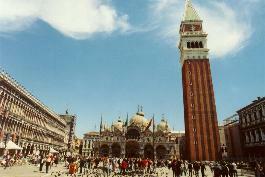 Originally, the trip to Europe was a group of five of us. Our group flew in three separate planes that converged at slightly different times in Paris (the air travel equivalent to auto-dependent, Single Occupant Vehicle travel that three in our group work professionally to discourage). Given the recent "9/11" World Trade Center terrorist attack, I made the goofy decision to carry a Swiss Army Knife in my checked luggage. This, of course, was quickly confiscated (meaning that our efforts to cut cheese or uncork European wine was later to become a comical challenge). Because of this, I suppose, I was also asked to remove my sneakers to check for additional contraband. Finding none, I was released. Overall, I was thoroughly impressed by the art, architecture, and urban design in our travels. The Italian food was simply outstanding. And for a few dollars, we bought Italian bottles of wine that put any American wines to shame. A pleasant observation: Much more so than in America, a very large percentage of the young men and women in the Italian cities were gorgeous, glamorous, and very physically fit. Interesting geographic factoids I learned: Paris is at the same latitude as Canada. Rome is the same latitude as New York City. Having sampled so many high-quality wines in my travels in Paris and Italy, my appreciation for drinking wine every day grew by orders of magnitude. Interestingly, like Charleston, which I believe is the most walkable city in America, the outstanding, highly walkable cities in Italy (and Paris) contain a large number of NARROW sidewalks. As a city planner often involved in city design, my expectations for my first trip to Europe were high. I had heard, for many years, about the quaint, walkable wonders of European cities, which made me quite exhilarated about the trip. I was not disappointed. 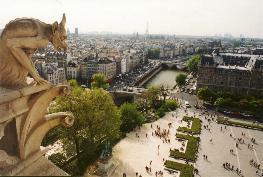 Paris and the Italian cities we saw were stupendous. Stunning. Spectacular. Europe is a cultural and culinary feast, and we greedily gobbled it up. A good nights' sleep comes easily after a full day of walking the streets in Europe. An amusing discovery I make when returning home: I look in all my bags and pockets, and cannot find my keys anywhere. I begin to start assembling duplicate keys for a new key ring. Then, two days later, I put on my sneakers. My foot gets caught because inside are my keys, $50 in cash, and my missing (fortunately electronic) plane tickets. Incredibly, I had walked several miles throughout several crowded Paris and Italian streets with the sneaker dangling from my backpack, flopping around and upside down wildly the entire time. Somehow, dumb luck meant that they did not fall out. There is a stark contrast between America and Western Europe. In America, we purchase luxury homes ("McMansions") and luxury cars filled with high-tech gadgets. The insides of our homes and cars are the most luxurious in the world. We work long, stressful hours so that we can buy the latest Lexus, the most impressive suburban home, and most expensive entertainment system. We have essentially turned inward. We are isolated and segregated from our fellow citizens within our private realm of home and car. We spend enormous amounts of time in our shiny metal boxes-our expensive BMWs and SUVs-stuck in traffic congestion on our gold-plated highways as we angrily battle with our fellow citizens to rush back to our remote, sprawlsville homes after a long day at the office, where we collapse in our moated, cul-de-sac'd cocoons. When we step outside onto our streetside sidewalk or public park, we encounter what is the most miserable, empty and unpleasant public realm in the developed world. What I found in Western Europe was stunningly reversed. The insides of homes and cars are noticeably modest. But each time we walked out into the surrounding community (the streets, the sidewalks, the squares-that is, the public realm), we are in a veritable paradise. 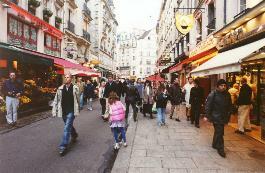 Outside, there is vibrancy, sociability, a sense of place, a sense of community, people laughing, people having fun. People have "siestas" during the workday. The public realm in Western Europe-available to all, regardless of economic status or ranking-is stupendous, lively, sociable, picturesque, romantic, and memorable. The streets, sidewalks, and squares are very quaint and human-scaled. You feel wonderfully alive as you walk amongst the large number of friendly residents who are happily outside enjoying their compact, walkable community-a community surrounded by forests and farms, instead of sprawling residential subdivisions and Big Box retail strips. The citizens of European cities enjoy interaction with their community and their fellow citizens, instead of being isolated and cooped up with expensive entertainment equipment inside luxury homes. They enjoy longer, more relaxed, more fun, and more enjoyable breakfasts, lunches and dinners at their countless outdoor cafes that are found throughout their cities. Americans seek quality of life by working long hours, making lots of money, buying lots of things and then "cocooning" indoors, away from their fellow citizens, who are, by now, strangers to be suspicious of-and to do battle with each day on raging, high-speed arterial roads during the commute to and from work. Europeans have opted for the more relaxed and friendly joys of community life in the public realm. The community is their living room. Each day brings a friendly, serendipitous walk in a sociable, urban Eden. When it comes to quality of life, the Europeans do it right. The standard of living in America may be higher. But the quality of life in Europe is unmatched. Our 2 weeks in Europe-my first trip to the continent-started with a few days in Paris. 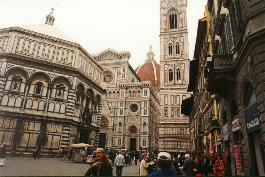 We then trained to Florence to spend a couple of days. From Florence, we rented a car to see Pisa and Lucca. Trained to Cinque Terre. Drove to San Gimignano and Siena. Back in Florence, we trained to Venice for a few days there. 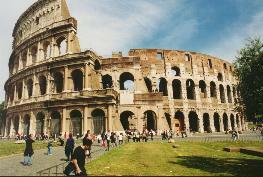 We then trained to Rome to enjoy 2 days there. Dom and Ann spend a few wonderful days in Rome, train north to spend a few fabulous days in Florence, train south to spend a few fantastic days in Montepulciano, train north to spend a few lovely days in Cortona, then train north to finish with a few stunning days in Venice. We both thoroughly enjoyed Montepulciano. I would now call that town my favorite of all the cities and towns I have visited in Italy. While I know that other ethnicities have admirable traits, as an Italian I am proud to know that Italians are the best in many, many ways. While in Italy, I was reminded that Italians have the best cars, food, gorgeous women (and men), gelato, ancient architecture, wine, art, transit & cities. Molto buona! However, Italians are second-rate when it comes to music and military might. Everywhere we traveled in Italy, Italians were listening to popular American songs. Very few seemed to listen to Italian music. And the Italian military over the past century shows quite well the old adage that Italians would rather love than fight. Make amore, not guerra! Ann and I were astounded by the high percentage of Italian women who are drop-dead gorgeous and glamorous. I speculate that one possible explanation for this is a virtuous cycle in Italy: In a culture where beauty is so highly valued (art, cars, architecture, streets, etc. ), some women worked very hard to look very, very attractive. This group of women grew to the point where Italy came to have a reputation as a place where beautiful women lived. That attracted even more beautiful women to move to Italy. Many women in Italy who are not beautiful then have roughly two choices to be competitive (i.e., be attractive to men compared to other women, and to be generally admired): (1) Move from Italy because they are unable to compete with the beautiful women in Italy; or (2) Work very, very hard to become beautiful. Both of these factors, over time, have increased the percentage of relatively beautiful women in Italy. “Pici,” a rustic, homemade, thick and chewy spaghetti pasta is served in a great many restaurants in Tuscany. It is DELICIOUS! Most Americans have grown up in communities that are utterly awful and unlovable. Huge, high-speed roads everywhere. Giant, deadening asphalt parking lots that create a swiss cheese lunar landscape. Terrible modern architecture. So when I arrive in Italy and walk its medieval, charming, romantic, ancient streets, I am thoroughly joyous by the spectacular beauty all around me. I can hardly believe how wonderful the ancient streets and buildings are to me. And it occurs to me that spending my entire life in the awfulness of American communities means that when I see such charm in Italy, the contrast is so vividly striking -- so absolutely night and day – that I am able to thoroughly appreciate what is around me in the Italian town. In other words, it takes a lifetime of living in a world of misery to truly enjoy the unsurpassed charm of these old villages. By contrast, many Italians have lived with this wonderful charm for their entire lives. Do they truly appreciate what they have? Or is the grass always greener somewhere else? Will they fight to protect their lovable communities, or ruinously seek to emulate America?